Ready to plant your tree? The first thing you need to do is to determine what you want the tree to do for you. A large tree to provide shade? An ornamental tree with beautiful flowers, leaves, or bark? A tree with dense leaves or needles to act as a windbreak or screen? A deciduous tree that cools the house in the summer and drops its leaves in the fall so the winter sun can warm the house? A tree that bears fruit for you or attracts wildlife? Answering these questions can help determine where to locate a tree and what type of tree you want or need. You also need to determine if the tree needs full sun, partial shade (like dogwood), or a wetter environment (like weeping willow). For help with selecting high quality nursery stock, refer to our handy Tree Owner's Manual. Check below the ground so as not to sever underground utility lines. Call a locating service (1-888-258-0808). Check local ordinances. 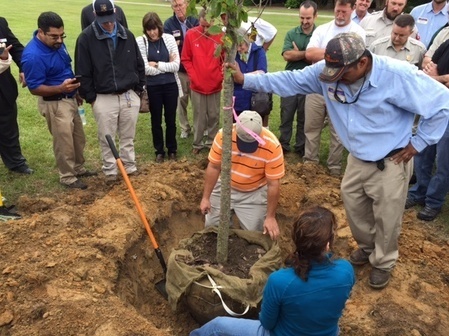 Some communities may have ordinances for planting types of trees and their care. Always get permission if planting on public property like along the right of way. 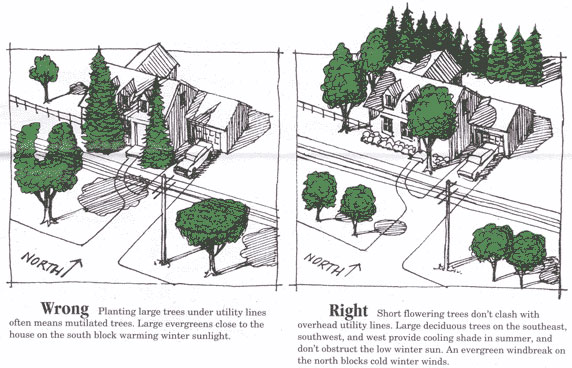 The illustration below provides the basic steps you should take to plant a tree. The hole should be 2-3 times the size of the rootball. Plant it with the root flare at or several inches above ground level. If it's a ball and burlap tree, remove the pinning nails and pull the burlap and wire cage back as much as possible. Cut away as much wire as possible. If it's a containerized tree, feather out the roots for better soil contact. 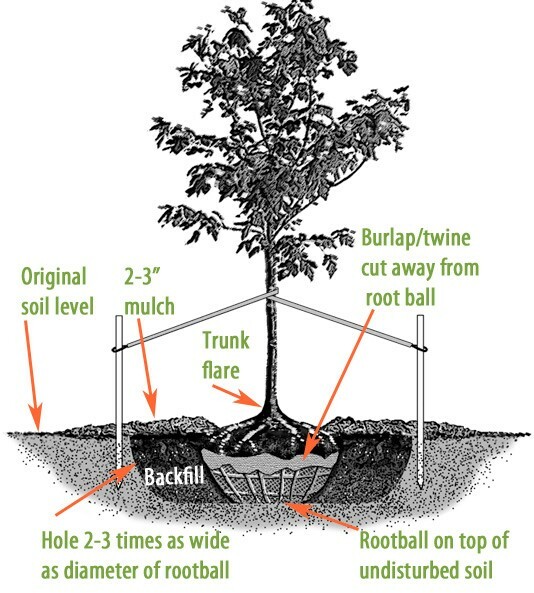 If it's a bare root tree, create a small mound underneath to support the trunk. Backfill half way and add water. Then complete the backfill and water again. When you backfill, DO NOT tamp the soil down with your feet as it compacts the soil and makes it difficult for roots to spread. Do not pile up mulch around the trunk of the tree (volcano mulching). Make a round berm of mulch around the planting hole to direct water towards the tree roots. Water the tree very well after planting and then every few days. Water at least once a week if there is no rain.